Since she acquired the [[Arkenpliers]], Wanda and her [[Decrypted]] [[Chief Warlord]] [[Ansom]] have defeated [[Unaroyal]] in the name of Lord [[Stanley]]. Their next target is [[Jetstone]]. As of late, Wanda has been showing off a new look. This look includes a [http://www.erfworld.com/wiki/images/8/85/Wanda_Expository.jpg Bride of Frankenstein/Rocky Horror Picture Show-esque Afro]. 95 % of the fans of Erfworld think the new hair-do looks absolutely horrible and does not fit the character at all. Though there has been an outcry from many of the series’ fans to change Wanda’s look and hairstyle back, the pleas have fallen of the deaf ears of the comic’s new artist. She's got no more great dialogue - and no one talks to her, as well. She spits out plot phrases like a third-rate noname redshirt. She does not use magic in battle, even when it would have been very handy. And her looks: bland. campy. corny. tasteless. wooden. unsexy. same vacant empty expression in every single frame. Side Note: Because of the major and unnecessary change, Erfworld has been losing it’s reader fan base more and more every day. It was rumored that if the change is not corrected soon, the comic itself will die out due to lack of interest. Wanda Firebaugh is a Croakamancer in the service of Lord Stanley. Before entering Stanley's service, she worked for the Kingdom of Faq. She is capable of casting a wide variety of spells, including the spell that summoned Parson, but claims to dislike casting spells which are not related to croakamancy. She has a talent and a taste for interrogation and is capable at it to the point she can break a Royal's will. Wanda's ability to gain Jillian's cooperation through torture suggests that Wanda has some talent for Turnamancy, since it seems similar to the process Vanna used while turning Duncan Scone. Jillian thinks Wanda's technique is superior to Vanna's. Wanda is absolutely convinced that the Predictamancer of Faq revealed to her some predictions about the future of Erfworld that are certain to come true. She knew that she would one day attune to an Arkentool, but did not know how this would come about. As a consequence, whenever she had to make a decision, she took the path which seemed to lead most directly towards the fulfillment of the Prediction. If a choice seemed likely to increase the probability that she would gain an Arkentool, she made that choice, even if it seemed horribly risky. So she conspired to bring Stanley to Faq, because it was possible that he would die in the battle, allowing her to take the Arkenhammer. When that plan resulted in the destruction of Faq, she encouraged Stanley to adopt the high risk strategy of questing for other Arkentools, because it was possible that he might find one she could attune to. The quest for Arkentools nearly led to the destruction of Gobwin Knob, so she persuaded Stanley to buy an untested, potentially dangerous, and highly expensive spell which might bring a "Perfect Warlord" to Erfworld. This spell ultimately did lead to Wanda's attunement to the Arkenpliers, which reinforced Wanda's conviction that the Predictamancer of Faq's Predictions had been true, and that her method of trying to push history in the "correct" direction does produce results. After she had obtained the Arkenpliers, Wanda made some comments to Parson which indicate that she thinks she knows some things about his future as well. Now that Gobwin Knob's campaign to conquer Jetstone has begun, Wanda has once again started to make very dangerous choices, such as her decision to deviate from the battle plans proposed by both Ansom and Parson. Given Wanda's past history, this apparent recklessness may represent an attempt to fulfill another of the Predictamancer of Faq's Predictions. The revelation that Faq has been restored with Jillian as its Queen means that Wanda needs to make a choice she had never before contemplated. Wanda never explicitly choose to serve Stanley rather than Faq. She originally hoped that Stanley would croak while attacking Faq. When Faq was destroyed, and Stanley wasn't, she made the best of things and joined forces with Stanley. She continued to serve Stanley even after she gained the Arkenpliers, though whether that's because she feels some loyalty to Stanley or simply because it seemed the best available option remains unclear. The restoration of Faq means that Wanda could theoretically choose to rejoin her former side, assuming that her loyalty to Gobwin Knob is not so strong as to prevent her from doing so. Since Wanda sees herself as a servant of Fate, she needs to decide whether she could more effectively achieve her Fate if she belonged to the repopped side of Faq. One reason she is uncertain about this is because she really doesn't know for sure how Jillian feels about her. Wanda originally believed that Jillian loved her so much that she wouldn't be able to break the Suggestion Spell. The fact that Jillian did break the spell suggests that perhaps she wasn't as deeply in love as Wanda hoped and believed. While they are aware that Ossomer has been captured and decrypted, they have not yet reacted to the substance of his comments. Instead, Wanda requests permission to croak and decrypt Jack, citing as justification the shortage of healing scrolls, rather than the more substantive issue of how he might react to the appearance of a Queen Jillian. Wanda cannot raise the issue of how Jack might react to Jillian without also raising questions about how she will react. And she doesn't know. One of Wanda's listed strengths is Fashion, so it's not surprising that she changes her raiment much more frequently than any other character. For a catalog of her costume, visit Wanda's Wardrobe. Note that this page is image heavy. 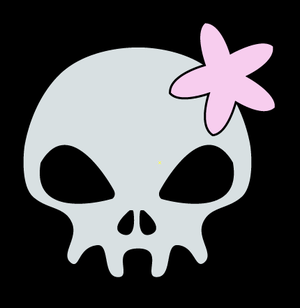 Wanda's livery is a Grey, flowered skull on a black field. Wanda may be the single greatest threat to Charlie's survival, because Wanda is trying to start an ideological war. As long as War is simply a matter of different sides competing for economic resources, then most Royals will not hesitate to hire a non-Royal Mercenary like Charlie, if it seems profitable to do so. But by spreading the idea that there is an inherent ideological conflict between Royals and Units attuned to the Arkentools, Wanda is damaging Charlie's ability to persuade Royals to hire him. Wanda's earliest known affiliation was with King Banhammer of the Kingdom of Faq. Wanda is sometimes referred to (for instance, by Sizemore) as "Lady Firebaugh," which may be an indication that she is a noble. Following Stanley the Plaid's discovery of the Arkenhammer, she attempted to acquire the Arkenhammer by arranging for Stanley to attack Faq. She claims she expected Stanley to be croaked, but her plan failed when Stanley destroyed Faq. She then changed sides, and encouraged Stanley to seek the other Arkentools. Erf-b1-p147 Since the fall of Faq. Wanda has behaved in a way that suggests she is loyal to Stanley. She obeys his commands and serves his side without being under any loyalty spells. However, this may have been only to preserve his power as a tool to aid her getting an Arkentool to attune to. During the events described in Book One, Wanda supplemented Gobwin Knob's rather meager forces by using Croakamancy to animate fallen troops as uncroaked. In particular, all of Stanley's remaining warlords (after the death of Lord Manpower the Temporary), were uncroaked. Wanda contributions to Stanley the Plaid's war effort during this period included the practice of her "hobbies" -- torture and interrogation. After Jillian Zamussels was captured and brought to Gobwin Knob, she was subjected to torture and a magic spell (presumably some sort of Thinkamancy) and persuaded to reveal Prince Ansom's battle plans. (There is also a heavily implied sadomasochistic relationship between Wanda and Jillian, which indicates Jillian may not have been totally unwilling.) Wanda also demonstrated that she was capable of handling a wide variety of other Magic, but professed to lack real interest in any besides Croakamancy. Wanda has recently come into ownership of the Arkenpliers and was able to 'attune' to them. According to her, it was Predicted in Faq "long ago" that this would come to pass, and that she has "wrecked and ruined" more than Parson (who, for perspective, had at the time of this comment just recently brought about the destruction of the entire Royal Coalition present at or near Gobwin Knob as well as all but a few soldiers on his own side) to ensure this would come to pass. Wanda was able to utilize the Arkenpliers to acquire control of a large army in a single turn because she had the remarkable good fortune to attune to the Arkenpliers immediately after an army of thousands were croaked and before the bodies vanished. The fact that she acquired an Arkentool at the exact time and place where her new tool could provide her with vast power suggests that her belief that she was 'fated' to gain an Arkentool is correct. Since she acquired the Arkenpliers, Wanda and her Decrypted Chief Warlord Ansom have defeated Unaroyal in the name of Lord Stanley. Their next target is Jetstone. Wanda knew that she was fated to one day attune to an Arkentool, but did not know which Tool it would be, or exactly how this would be accomplished. This suggests she has not been in direct contact with the Predictamancer she knew in Faq. However, now that at least part of her Prediction has been achieved, she may try to seek out further contact with said Predictamancer, assuming he or she is still alive. Given her capacity for casting spells outside of Croakamancy, it's possible that Wanda was required by King Banhammer to function as a Predictamancer, despite her preference for Croakamancy. If so, it would explain the lack of loyalty she displayed toward Faq. This interpretation is not entirely consistent with the way Wanda explained things to Parson. But if Wanda was capable of acting as a Predictamancer, but really didn't want to, then she would have good reason to hide her capability from Stanley and Parson. After all, if they knew she could act as a Predictamancer, they would order her to do so. If this interpretation were correct, it would help explain why Wanda sees herself as a servant of Fate. Her name is a pun on "wand of fireball", a fairly common magic item in "Dungeons & Dragons" and other fantasy games. Depending on pronounciation, her last name also becomes "firebug", a slang term meaning someone who relishes causing destruction, especially through the usage of fire. A very prophetic last name indeed, given the pivotal role she plays in the Volcano Uncroaking.